Now you no longer need to cut-out a test sample from a large sheet of coated, tinted or processed material to make qualifying transmission measurements in a bench-top type spectrophotometer. You can bring the LCRT-2005-S to the glass, plastic or film sample and make transmission measurements or profile the sample on site with the same level of accuracy as with the laboratory based instrument. Compact spectrophotometer designed for light transmittance measurement of coated and uncoated materials within the visible spectral range. Separate independent source and receiver units enable measurement of large size, framed and integrated objects such us windshields, solar cell cover glass, windows, cast glass. Sample 50x50mm glass plates typically measured in laboratory type spectrophotometers can be measured as well. The instrument is simple to operate and mobile for on-site use. Calibrated filters are available with light transmittance values as specified in published standards, 70% light transmittance for ECE R43 for example. The filter standards are supplied with traceable calibration certification as required. Or simple 100% reference setting can be made without a light transmittance standard filter. Employing two diode array spectrometers, one in source and one in receiver, light transmission measurement quality and stability rival that of a dual-beam spectrophotometer. Another key feature is the LCRT-2005-S ability to simulate CIE Standard Illuminant A or D65 day light illumination light spectra and photometric V(λ) responsivity through a spectral measurement correction method. 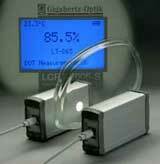 Since pulsed light is used as the source signal, measurements are made independent of ambient light. Both spectral light transmittance within the total visible range and monochromatic transmittance at selected wavelengths can be measured. A plot of spectral transmittance can be displayed. The source is built with a rugged ODM98 integrating sphere and LED light sources. The alignment of source and receiver is simplified by an internal camera. Up to 100 measurements can be stored in memory and read out via the USB interface later with the software supplied. The LCRT-2005-S measurement geometry enables the measurement of light transmittance by placing the source directly on the sample (D/0). The absorption error caused by re-reflected light from the test sample back into the source is compensated by the source reference spectrometer. By enlarging the distance between source and sample the source illumination becomes increasingly parallel. In this 0/0 measurement geometry the regular light transmittance component is measured. The difference between total and regular transmittance is the diffuse component. The unique ability of the LCRT-2005-S to adjust the test sample illumination characteristic between diffuse and parallel, helps to increase the signal to noise ratio for scattered light (haze) measurement. The very narrow field-of-view of the receiver enables the measurement of real in-line transmittance used to specify the transparency of ceramics. Complete description, specifications and ordering information for the LCRT-2005-S and accessories are provided in the PDF data sheet. The Mechanics & Stages data sheet fully describes Gigahertz-Optik's hardware including the B2S-75-TRTH bench set-up for regular, diffuse and real in-line transmittance and PMS-RIT stand for real in-line transmittance measurements with the LCRT-2005-S. Your company manufactures solar cells. You responsibilities include optimizing light transmittance of the multi-layer thin film stack that is deposited on the cell's transparent substrate and checking the uniformity of the light transmissive layer across large surface areas. Also the light transmission of the anti-reflective coating over the solar module cover glass needs to be evaluated to ensure maximum light absorption.